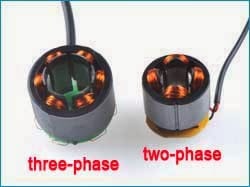 Three-phase brushless DC technology is an excellent upgrade of two-phase brushless DC technology. The traditional two-phase motor has 4-slots stator and two pairs of magnetic fields. It must put a hall sensor inside of the pump body to check the rotor position. So we need to put the circuit inside of the pump. When the pump was working, the motor’s current will cause a high temperature (sometimes even more than 100 Celsius). In general, electronic component’s temperature resistance is 85 Celsius. So we usually produce two-phase pump’s current 2 amperes or less and need to guarantee the environmental water temperature less than 60~70 Celsius. Otherwise, pump’s reliability cannot be ensured. Three-phase brushless DC motor has 6-slots stator and three pairs of magnetic fields. The pump use MCU control, intelligent commutation position detection without additional sensors. So we do not need put any electronic component inside of the pump body. We put all the circuit outside of the pump body, using the Aluminum case potting by epoxy. Therefore, the high temperatures generated by the motor work will not influence the circuit. Meanwhile, we replaced all the pump’s materials to the high-temperature resistant materials; then the pump can be used in hot water even more than 100 Celsius. Three-phase brushless DC pump has many advantages than two-phase brushless DC pump. 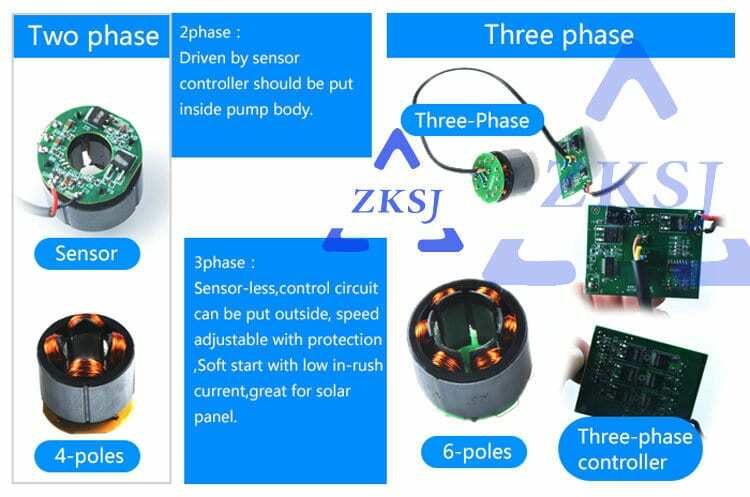 When we use three-phase brushless DC motor driven instead of two-phase, we can make the pump power much higher, that means much larger flow rate and higher head. Due to the using of MCU, we can add many program functions to the pump, such as Reverse protection, stuck protection, over-current protection, manual speed control, gifted program and so on. Some things need to attend, three-phase DC is entirely different from three-phase AC. Three-phase DC has the same power supply with the two-phase DC, and it has two power cables, one positive and one negative. However, the three-phase AC has three power cables.